Birmingham, Ala., on Sept. 9. 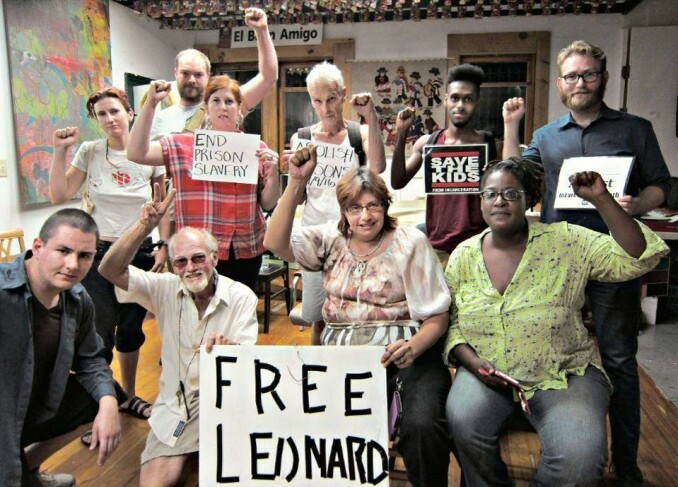 On Sept. 9, the 45th anniversary of the heroic Attica prison uprising in New York, inmates across the country struck a blow against today’s slave labor in U.S. prisons. Inmates are routinely compelled to toil for as little as 25 cents an hour. In many state facilities, they are not paid anything for their forced labor. Prisoners mobilizing with the Incarcerated Workers Organizing Committee of the Industrial Workers of the World organization called on other inmates to strike by withholding their labor — and, in the prisoners’ words, “let the crops rot in the fields.” Additionally, solidarity actions took place the same day in many locations. Below are descriptions of some of them. A small solidarity protest outside Holman was harassed by police. Immigrant rights activists rallied in front of the historic 16th Street Baptist Church in Birmingham to demand closure of the Etowah County Detention Center. Immigration and Customs Enforcement is infamous for abuses against inmates regarding access to health care, family members and legal advice. 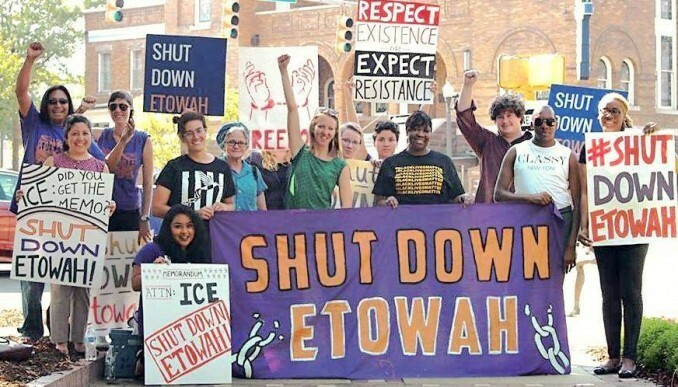 Participating with Shut Down Etowah were the Adelante Alabama Worker Center and activists from Birmingham Black Lives Matter, the LGBTQ community and other groups. 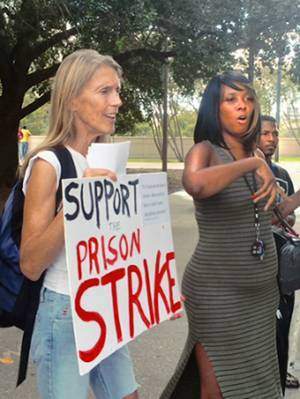 Crowds gathered outside the Harris County Jail on Sept. 10 as activists spoke about the prison strike going on from coast to coast, including Texas. They exposed the prison slavery that exists in all Texas prisons, where prisoners are forced to work but paid zero cents an hour for their labor. Many families joined the protest and spoke out about what had happened to their husbands, boyfriends, fathers and husbands. Said one: “I’m afraid to give my name because they have already beat my son, but I thank you all for being out here to support our children. I’m so afraid my child will not come out alive.” This fear is real as at least 12 jail inmates were found dead last year in the jail. Two lines of dozens of uniformed police stood threateningly at the front entrance of the jail, giving stern looks to all who entered. Many visitors were stopped and questioned about why they were there. This intimidation did not stop people from joining the demonstration and condemning the treatment going on inside the walls. Demonstrators rallied outside Tacoma’s Northwest Detention Center to denounce gross violations of prisoners’ rights and stand in solidarity with imprisoned migrant workers. The action was called by Northwest Detention Center Resistance. Additionally, activists rallied outside the State Department of Corrections in Olympia and then marched to Starbucks, which profits from superexploitation of prison labor. 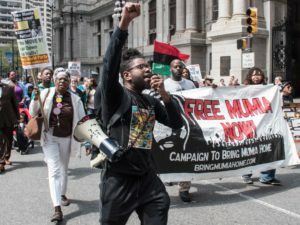 Hundreds of activists gathered at Chap­man Square across from the Justice Center, a detention facility, where they cheered in solidarity with striking prisoners. 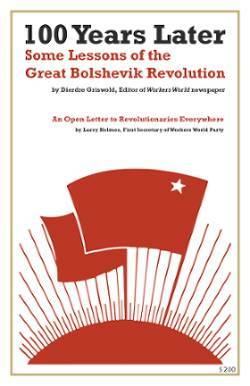 Speakers condemned capitalism, too. 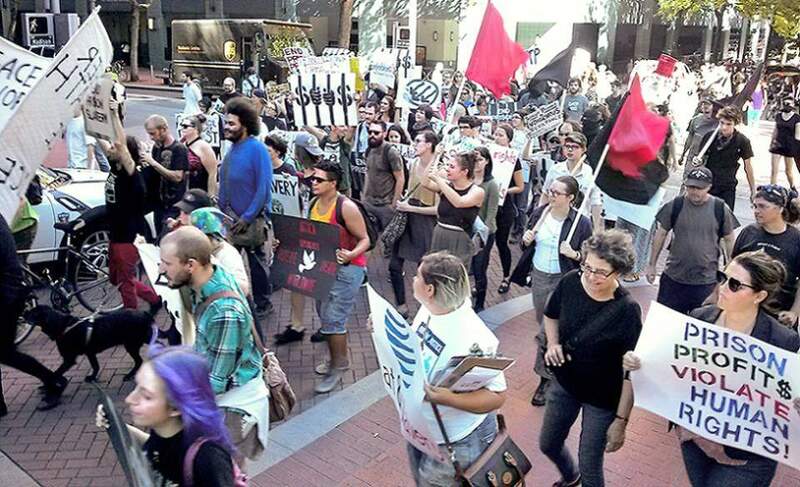 Black Lives Matter and September 9th PDX played prominent roles in organizing the demonstration. Right 2 Survive PDX and Right 2 Dream Too denounced racist policing and prison slavery. They work to empower the homeless and disenfranchised to oppose government abuses — and run a cooperative homeless encampment. Demonstrators then militantly marched into the streets without a permit and stopped traffic, chanting “End prison slavery!” near Portland City Hall. One grouping ripped apart a blockade that stood in the marchers’ way, as hundreds filed into a nearby intersection and held it for several minutes. Another grouping then directed traffic so participants could safely continue their march. A “noise demonstration” in front of the new Wayne County jail’s construction site expressed solidarity with striking prisoners and called for an end to prisons and jails. Jail construction began in 2011, but was halted in 2013. Some 100 activists from various political and community groups used whistles, pots, pans, plastic buckets, drumsticks and homemade noisemakers. Energy and spirits were high as more people joined the action. Protest songs rang out. A banner reading “No new jails, no old jails!” was put up and led the march to the current Wayne County jail. The march wove through Greektown, where fliers about the prison strike and the Attica uprising were distributed; then a rally took place outside the Wayne County jail. A chant of “No more cops! No more jails!” brought support from prisoners. Defying police instructions to move onto the sidewalk, protesters stayed in the streets and marched outside the prisoners’ cells. They chanted “We love you!” to the inmates, who pounded on the windows to acknowledge the demonstrators. The march ended back at the new jail’s site, with activists still blocking the streets. In this city — notorious for locking minors in solitary confinement — several dozen activists held a march and noise demonstration outside the Juvenile Justice Center. With drums, noisemakers, firecrackers and megaphones, activists loudly showed their solidarity with prisoners, including youth and those subjected to slave labor. 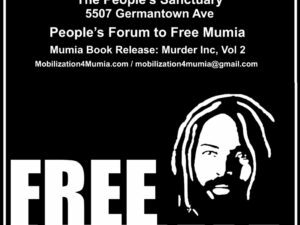 Banners stating “Burn down the plantations!” and “Mumia: We got you!” were visible throughout the demonstration. Despite a heavy police presence, no one was arrested. This ”Justice” Center is a key link in the region’s school-to-prison pipeline. Built in 2012, the year that Philadelphia shut down 37 public schools, it funnels low-income, mostly Black and Latinx students into the corrections system — where as adults they may be exploited as prison slave laborers. Dozens of militant protesters gathered outside the Hall of Justice to support the historic, nationwide, imprisoned workers’ strike. The Incarcerated Workers Organizing Committee organized the rally. 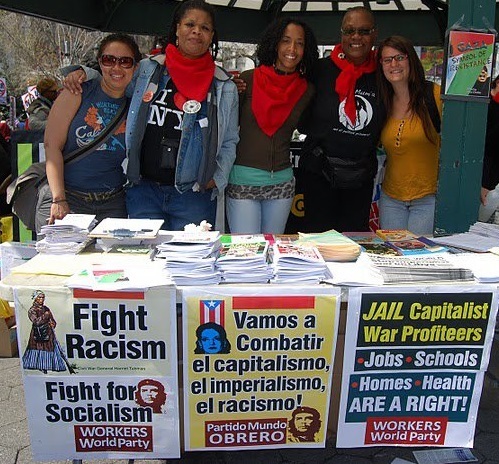 Several community organizations attended, including Workers World Party. Talila Lewis, an African-American professor from the Rochester Institute of Technology, represented prisoners with disabilities, especially those who are hearing-impaired. Lewis founded Helping Educate to Advance the Rights of the Deaf. HEARD created the #DeafInPrison campaign to “raise awareness about abuse of and discrimination against Deaf prisoners across the nation.” Lewis noted that people with disabilities are incarcerated in disproportionate numbers relative to their population in the U.S.
Later, a caravan of vehicles traveled to the infamous Attica prison for a noise demonstration in solidarity with the inmates. Although local media have been silent about these rallies, the demonstration at Attica attracted the attention of police, who pulled over several cars for bogus violations after they left the protest site. The Buffalo Anti-Racism Coalition tied the current wave of prison activism to the heroic Sept. 9, 1971, Attica Rebellion by hosting a documentary viewing and discussion event.